Joey Mawson (Van Amersfoort Racing) and Mike David Ortmann (Mücke Motorsport) are the winners of two Saturday’s races of the ADAC F4 Championship at Zandvoort Circuit. The seventh round of the 2016 season was the first ever visit of the German junior series to the Dutch circuit. Both winners started the races from pole positions, Mawson in the first race and Ortmann in the second race. The 20-year-old Australian cruised to his eighth win of the season to extend the championship lead ahead of Mick Schumacher (Prema Powerteam), who finished third in the first race. Mike David Ortmann started second and finished in the same position. 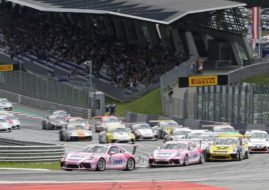 The race was interrupted by one Safety Car period after Sophia Florsch spun off to the gravel on Lap 7. After the restart, Mick Schumacher stole the third place from Lirim Zendeli (Mücke Motorsport). In the second race, Ortmann started from pole and crossed the finish line as the winner half an hour later. His teammate Lirim Zendeli this time succeed to defend his podium position and he finished second. Mick Schumacher, who started sixth, progressed to the third place during the opening lap and stayed there until the end. The championship leader Joy Mawson had a problematic Race 2 and he finished out of the points, so his advantage over Schumacher felt to 41 points, with four more races to go. Third race at Zandvoort Circuit is scheduled for Sunday in 10.20.